This small, gilded brass instrument is made up of a thin, graduated circular plate with an internal semicircle removed to create a straightedge on a diameter. The engravings are very accurate. The instrument is signed by David Usslaub, about whom nothing is known. 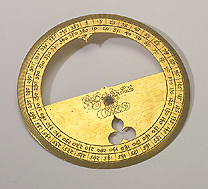 The protractor is associated with the group of mining instruments brought from Germany by Prince Mattias de' Medici in 1635.